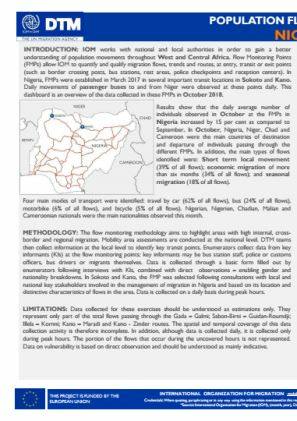 In Nigeria, FMPs were established in March 2017 at several important transit points in Sokoto and Kano to track the passage of travellers to and from Niger. This dashboard is an overview of the data collected at these FMPs in January 2019. 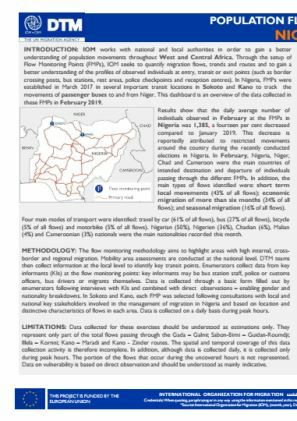 Results show that the daily average number of individuals observed in January 2019 at the FMPs in Nigeria was 1,618, an increase of one per cent as compared to December 2018. Nigeria, Niger, Chad and Cameroon were the main countries of intended destination and departure of individuals passing through the different FMPs. 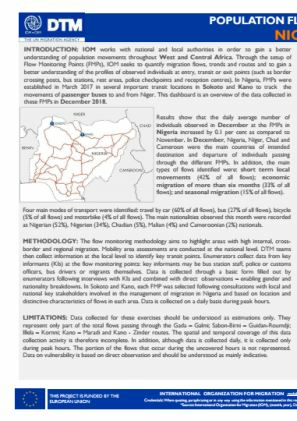 In addition, the main types of flows identified were: short term local movements (42% of all flows); economic migration of more than six months (33% of all flows); and seasonal migration (15% of all flows). The main nationalities observed this month were recorded as Nigerian (56%), Nigerien (34%), Chadian (5%), Malian (43) and Cameroonian (2%) nationals.